Russian Empire in Europe, The. / NW Sheet. Map by Frdr. Wilhelm Streit (Ronneburg, Thuringia, 1772 – Berlin 1839). Steel engraving colored in outline. (1836.) 11⅛ × 9 in (28.4 × 22.8 cm). Title sheet of the 4-sheet map. – The coast from Stettin , with Königsberg , the Baltic Provinces & Finland as well as the Gulf of Bothnia. The Swedish coast from Ystad, otherwise still with Gothenburg & Christiania, in the north from Tromsø via Hammerfest – North Cape to Kola Peninsula, in the southeast still with Tver. 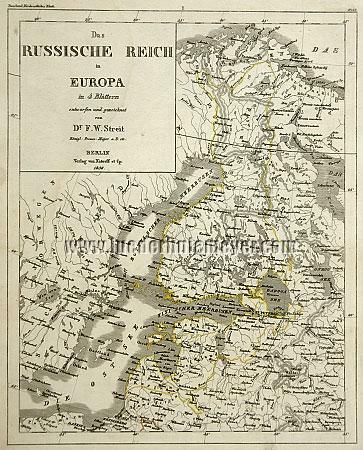 Finely entered Petersburg along with the Ladoga Canal executed by Burchard Christoph von Münnich “which … should make Russia’s trade with the rest of Europe thrive … (and) immortalized (Münnich’s) name in the field of hydraulic engineering” (Allgemeine Deutsche Biographie XXIII , 19 ff.). – With the postal routes .